OXNARD, Calif. - March 11, 2019 - PRLog -- Beginning April 6th, hop on the bunny trail and celebrate the arrival of spring with exciting happenings at The Collection at RiverPark with the annual Bunny Hop event and photos with the Easter Bunny inside The Annex Food Hall on Park View Court. On April 6th from 10 a.m. – 12 p.m. have a hoppin' good time and start your spring fling off right at The Collection's annual Bunny Hop event presented by our community partners Dignity Health's St. John's Pleasant Valley Hospital, located in Camarillo, and St. John's Regional Medical Center, located in Oxnard. "This event is a fun way to celebrate Easter with your family," said Darren W. Lee, President and CEO of St. John's Pleasant Valley Hospital and St. John's Regional Medical Center. "It allows our community to come together and enjoy a springtime tradition." Guests of all ages are invited to join in the fun with special arts and crafts and activities with several local businesses including supporting sponsor Sunny Smiles Dentistry for Children and Young Adults. For more springtime excitement, bring the little ones to The Annex Food Hall at The Collection and capture those special close-up moments with the Easter Bunny! Beginning weekends from April 6th – April 20th, visitors can dress up in their seasonal springtide best and pose with everyone's favorite bunny with a new picturesque backdrop! Photo packages are available for purchase, for prices, photo times, and more information please visit TheCollectionRP.com. 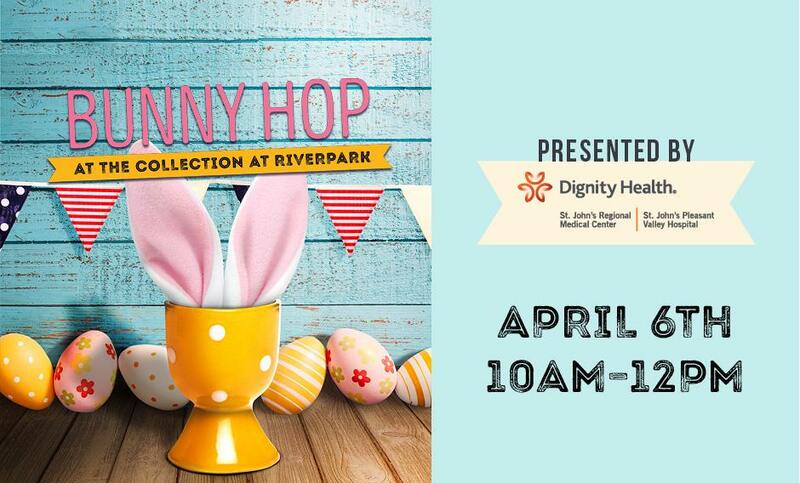 "We are thrilled to bring back the bunny photos and the fun Bunny Hop event to The Collection," said Jill Almonia, Marketing Manager at The Collection at RiverPark. "We are excited to host Bunny Photos in The Annex Food Hall again this year, as it provides a family-friendly environment for these fun activities." Saturday April 6th 10 a.m. – 7 p.m.
Sunday April 7th 12 p.m.-- 6 p.m. The Collection at RiverPark is a 750,000 square foot, open-air specialty retail center located in the heart of West Ventura County. Inspired by the beauty of the California coast, The Collection reflects the unique atmosphere of the surrounding seaside communities. The Collection is built around a town grid of retail streets, each of which has its own personality-a carefully crafted assortment of established and contemporary designer shops, distinctive dining, and signature entertainment venues. Anchors include Target, Century RiverPark 16, REI, Whole Foods Market, H&M, 24-Hour SuperSport and The Container Store. Restaurants include Yard House, Larsen's Grill, Gen Korean BBQ, Lazy Dog Restaurant & Bar, Maria's Italian Kitchen and more. Follow us on the web, Facebook, Twitter, Snapchat and Instagram at TheCollectionRP. The Annex is a 16,000-square-foot Food Hall located within The Collection, Ventura County's premier shopping, dining and entertainment destination. The first Food Hall in Ventura County, this gathering place celebrates the spirit of small business and local operators. A culinary focused, community-minded marketplace, The Annex shops and eateries feature an eclectic collection of purveyors blending dining experiences and unique flavors in a shared space with bar front eating and common area seating. St. John's Pleasant Valley Hospital in Camarillo and St. John's Regional Medical Center in Oxnard are members of Dignity Health Central Coast, an integrated network of top quality hospitals, with physicians from the most prestigious medical schools, and comprehensive outpatient services - all recognized for quality, safety and service. Both hospitals are supported by an active philanthropic Foundation to help meet the growing health care needs of our communities. Hospitals in the Dignity Health Central Coast region also include Arroyo Grande Community Hospital in Arroyo Grande, French Hospital Medical Center in San Luis Obispo, Marian Regional Medical Center in Santa Maria. Learn more at DignityHealth.org/PleasantValley and DignityHealth.org/StJohnsRegional.